About 7 years ago I started my hunt for the perfect companion. I searched online, I went to shelters, I looked everywhere. Finally, in June of 2004 I found her. 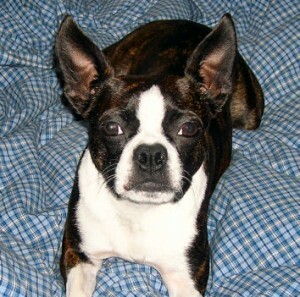 Her name was Rosie and she was a 3 month old Boston Terrier, the last one left in her litter. She was Perfect! Rosie is now 5 years old and the Queen of the house. I kept her name Rosie because she already knew it and it fits her perfectly. She is spoiled beyond belief and has broken every house rule there is. No dogs on the couch – broke it. No dogs upstairs – broke it. No dogs on the bed – yep, broke it! She is a Princess in full form, she is my world and I would do anything for my puppy!